Still taking the heat—and dishing the heat—on the Tombstone fight. I almost always find new things when we delve into the famous affray. 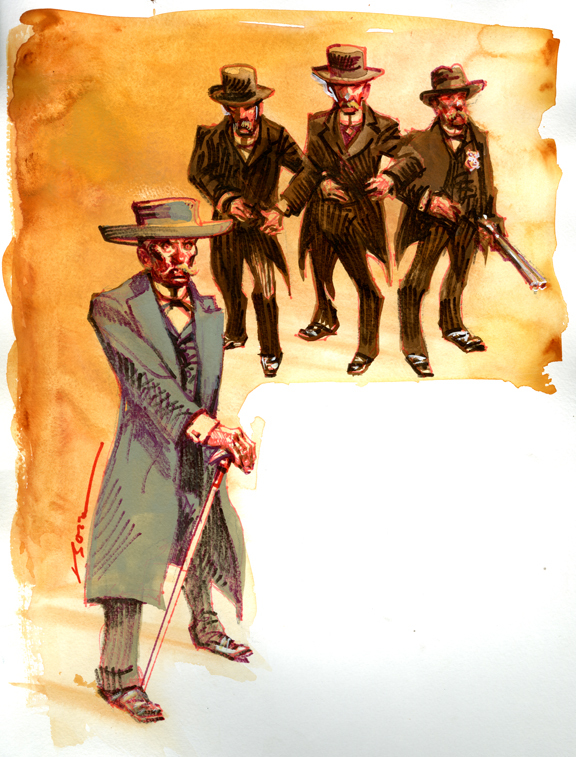 We have this popular image of Doc Holliday and the Earp boys strapping their holsters on, checking for cartridges and thumbing the hammers, but here is an eyewitness account on the events of October 26, 1881: "I saw Holliday put [a six-shooter] in his coat pocket. I saw one in Morgan Earp's pocket, on the right side of his coat. Wyatt had his right back here, (indicating) stuck in his pants. I think a little on the right side. . .I was about 10 or 12 feet from Holliday, Morg and Virg." Meanwhile, another eye witness saw Virgil standing with two other men. "I saw the marshal in the doorway of a vacant store with a double-barreled shotgun. He had the shotgun in his left hand." Daily Whip Out: "Standing On A Corner In Tombstone, Arizona"
Yes, The man in gray, Dr. John Henry Holliday, stood out in the intersection of Fourth and Allen Streets and eyed Frank McLaury, who stood for a time at the corner of Fourth and Fremont Streets holding the reins to his horse and eyeing Doc and the Earps and the crowd standing in front of Brown's Hotel. Several in the Earp field have disputed my quip in The New York Times that the lesson of the O.K. fight is "don't bring a drunk dentist to make an arrest." One prominent Earp expert said, "We have no evidence Doc was drunk at the time of the fight." Well, okay, but couldn't you also make the opposite claim: "We have no evidence Doc wasn't drunk at the time of the fight." Since my father was an alcoholic I think I know a little bit about how alcoholics function, day to day, and my response to the Earp expert was, "How long do you think an alcoholic waits to have a drink when he gets up?" Short answer, not two-and-a-half hours. Okay, to be fair, let's say Doc got up at noon (both Sheriff Behan and Wyatt Earp got up around noon since they were out gambling most of the night). By 2:30 how many drinks do you think an alcoholic like Doc would have consumed? I would be willing to bet the answer is not zero. And, I think it's safe to say, the odds are that Doc Holliday had more than one drink in the two-and-a-half hour run-up to the fight. And I don't think it's out of the question that he was lit up by the time of the fight. At least lit up enough to make a threatening move with a shotgun, even though Virgil asked him to be cool. The Earp experts don't want to admit he was in his cups, because it makes the Earp side look bad, reckless even. I believe Doc drank just enough to calm his cough and was not 'drunk' at all. I do think by early morning he was after an all-night card game but, you have to be somewhat sober, too, to play as well as he did.